Picture a Day - The Holy Land Revealed: Update -- Today, It's Called "Forex." Then It Was Called "Money Changing"
Update -- Today, It's Called "Forex." 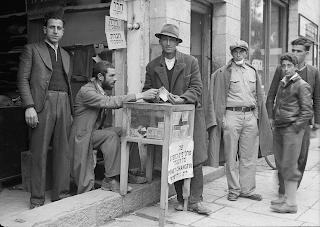 Then It Was Called "Money Changing"
In January we presented a feature on Jewish money-changers in Jerusalem 75-80 years ago. The signs behind them showed that they provided full financial services including property sales and rentals, mortgages and stocks. Previous posting: For millennia the commerce of the world has had to deal with different currencies. The Bible refers to various coins, often a name referring to a specific weight. Every country, province, king or governor minted a local coin. Travelers had to exchange one currency for another to do business. Jewish pilgrims to the Temples in Jerusalem had to convert their coins to local currency to pay for their sacrifices or lodgings. Agricultural tithes were converted to coins which were brought to Jerusalem. 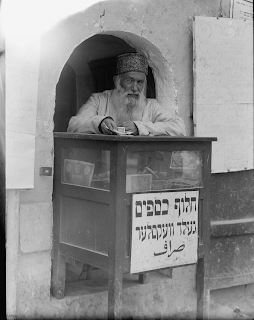 The Talmud refers to a money changer as a shulchani (literally a "person at the table"). According to the New Testament, the money changers were driven from the Temple by Jesus. The allegedly unsavory character of money changers continued into the Middle Ages as seen by Shakespeare's depiction of Shylock. When Jews were dispersed throughout Europe and Asia, the profession was an easily portable trade. Jewish ties between communities facilitated letters of credit. The Rothschild banking dynasty, for instance, begun in the 16th century, had family branches in Austria, Germany, France, Italy and England. As recorded by the American Colony photographers, Jewish money changers set up their shulchan on the street. Click on the pictures to enlarge. Click on the captions to view the original picture. If those money-changer shops are where I think they are, i.e., Machaneh Yehuda, they're still there. The old German WECHSELN , to exchange, was the source of the family name Wechsler or Wexler. 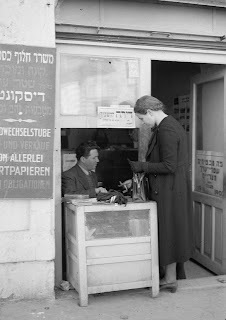 Note the sign Geld Wechsler, Yiddish for currency exchange. The Hebrew "Sha'ar" for exchange rates is because that is where money changers would locate- at the entrance to the city - hence the plethora of moneychangers at Sha'ar Yaffo/ Jaffa Gate.